Fourteen children, who had been trafficked from Bihar and forced into labour, were rescued from the garment establishments in Old Seelampur today. The rescue operation was led by Sandeep Gulati, SDM, Geeta Colony, accompanied by the police, members of the Labour Department and activists of Bachpan Bachao Aandolan (BBA), an NGO. The Delhi police today claimed to have cracked a case of the robbery and murder of a 64-year-old schoolteacher in Timarpur that took place on Tuesday. Three persons have been arrested for being allegedly involved in the crime. The North Delhi Municipal Corporation (NDMC) is all set to upgrade the education system in the schools of its area and introduce new methods of teaching. The civic body has devised several new projects to impart quality education to municipal primary students. In an effort to contest the Delhi Sikh Gurdwara Management Committee election, a delegation of the Shiromani Akali Dal (Delhi-UK) submitted a memorandum to the Lieutenant Governor of Delhi, Tejendra Khanna on denying an election symbol to the party by the Directorate of Gurdwara Elections, Delhi government. Delhi received its first talking ATM machine for the visually challenged students installed at Jawaharlal Nehru University (JNU) today. JNU received the machine which is accessible to others also as Antarchakshu, a sensitization workshop, kicked off on campus. Delhi Transport Minister Ramakant Goswami released a book titled 'Sikh Heritage'. It contains the incidents of Sikh history that have been shown through stamps being used in different countries. BJP MP Ram Jethmalani's revolver and his arms licence were allegedly stolen from his Gurgaon flat today. According to a complaint filed late night at sector 40 police station, an unknown person had stolen his revolver and arms licence from his flat at Raheja Atlantis at National Highway Number 8. The children, all between the age group of 8-15 years, were made to work for long hours as much as 15 hours in a day in inhuman conditions for over six months. "I was brought here by a trafficker who gave me away to this employer. I worked from 9 am till 12 at night. I did not get any wages for my work," said an eight-year-old child rescued today. In the rescue operation, two employers were arrested and nine establishments sealed. BBA chairperson R.S. Chaurasia said, "Child labourers in a large number are still working in small factories and unorganised sectors in Delhi. Till such time that the law enforcement agencies start recovering back wages, impose heavy fines and penalties and make child labour uneconomical, the illegal industries will continue to have child labour." 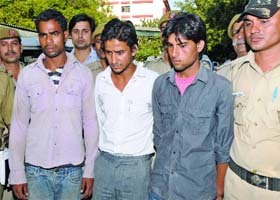 The accused have been identified as Rahul Prasad Singh (22), Rahul Gautam (19) and Nadeem Khan (24). The police has recovered stolen articles, Rs 5,500, one gold chain, 20 national saving certificates from their possession. The accused Rahul Prasad lived just opposite to the victim's flat, said a police official. "The activities of Rahul Prasad appeared suspicious. He gave unsatisfactory answers during investigation," said Sindhu Pillai, Deputy Commissioner of Police (North). During interrogation, the police alleged that he broke down and said that he, along with two of his friends Gautam and Khan, hatched a conspiracy to commit robbery in the victim's house as they thought that a huge amount of cash and jewellery were kept in her house. When the victim tried to raise the alarm, the accused allegedly killed her, said the official. 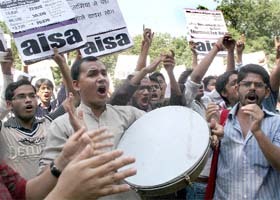 Gautam and Khan were apprehended at the instance of Rahul Prasad. The NDMC has sought the help of a UK-based non-government organisation (NGO), Plan India, for supporting them in their pilot project that will be implemented by April next year. The corporation has identified 30 schools in its jurisdiction for the implementation of the project, said Rekha Gupta, chairperson of the education committee. "We will develop the new method of teaching. Initially 30 schools will be fully computerised. These schools will have indoor games section. School buildings will be reconstructed like those of private schools. We will also be planning to change the dress code. The NDMC has taken an initiative to upgrade the education level in the municipality schools so that more children can come and enjoy learning," said Gupta. The NDMC has asked the NGO to help them in upgrading the education system. Officials of the NDMC said that they will urge the Delhi government to use the same project in their schools. Teachers for music, dancing and physical education will be recruited in these 30 schools. "In these schools, we will use a unique method of teaching. Children who are often left behind in study will be given extra classes by trained teachers," she said. The projects will work on four main points focusing on enabling environment, teaching-learning process, child resource centre and dissemination practices. "Students will be provided an environment where they can enjoy learning. Teachers will also be trained to use the best method of teaching and will be able to identify students who are in need of academic support to fulfil their learning gap," she added. The delegation members told the Lt. Governor that despite the repeated pleas of the party, the Directorate of Gurdwara Elections did not provide the symbol to the SAD (Delhi-UK). Denying it is a direct violation of the democratic values of the country, they said. The delegation was led by the party president Jasjit Singh. Other members of the party who joined the delegation were senior vice-president Sukhbir Singh Kalra, vice-president P.S. Bakshi and Youth Wing president Amarjit Singh Rajan. Jasjit said that the Lt. Governor considered the facts mentioned in the memorandum and instructed the officials of the gurdwara election department to take appropriate action in the matter at the earliest. When asked why the party has not been given the symbol, Jasjit said, "I do not know the reason. In democracy everybody has the right to contest the election. Creating hurdles in the way of getting the symbol will not help anybody win the election. Now the Sikh community in Delhi understands who can serve them better." He added, "With the directions of the Lt Governor, I hope my party will be given the symbol soon." The vice-chancellor inaugurated the voice-guided ATM machine outside the central library. The State Bank of India has begun the process of transforming over 2,500 of its ATMs nationwide. These talking ATMs will not only allow access to the visually impaired people but also to those having physical disabilities. This transformation is being undertaken by NCR, India's largest ATM service provider. These ATMs are incorporated with software and hardware features which ensure that a person with a disability can operate the machine on his own, while maintaining the safety of the transaction. These machines are designed as per Access for All (AFA) standards and comprise accessible key pads, voice-guidance technology, Braille stickers and multi-lingual facilities. "Apart from reading aloud screen messages, the machine also provides complete orientation making it easy for the customer to use the machine. An important feature of this ATM is that it provides the person an option to blank out the screen as a safety mechanism," said the NCR spokesperson. Speaking on other measures to make JNU friendly to the differently abled, university rector Sudha Pai said, "JNU is working towards creating a barrier-free environment. We had ordered a survey of all the existing buildings which need architectural changes. We are almost through with the survey, and within the next two years, we hope JNU will have a barrier-free environment." "Most of the JNU buildings are not very favorable to the differently abled. They need to have architectural alterations. There are several firms that specialize in such alterations. We have hired a couple of companies who will now undertake the task," she added. The Minister said that one could understand the community's history after going through the stamps. More than 10 countries have stamps of the historical events of the community. The prominent Sikh personalities present on the occasion were former Member of Parliament Tarlochan Singh, Delhi Minorities Commission member Pushpinder Singh and Ranjit Singh who collected the stamps. Jethmalani had got that revolver during the Emergency. He had moved in Gurgaon flat after the death of his daughter Rani Jethmalani, who used to live in it. The Rajya Sabha MP has however been allotted a bungalow in Delhi and it was during the shifting that he realized that his revolver and licence were missing. The Gurgaon police has started the investigation, but no arrest has been made so far.